The Tesla Quartet performs at a WDAV Small Batch concert. 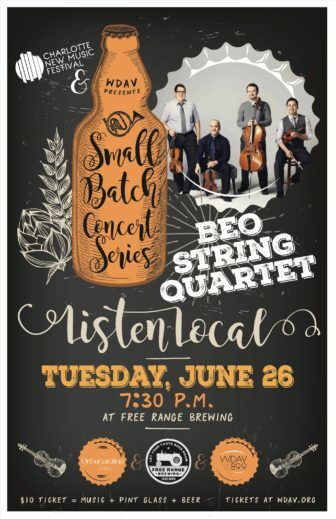 A classical public radio station in North Carolina has tapped into new audiences by organizing concerts that have string quartets sharing performance space with casks of aging beer. 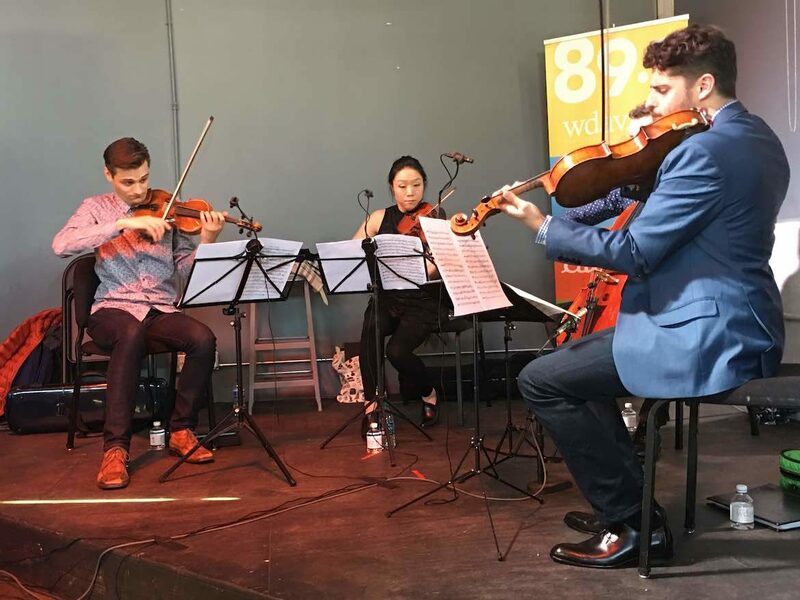 Organized by WDAV in Davidson, and held at a brewery in Charlotte, the quarterly Small Batch Concert Series has attracted standing-room-only crowds of more than 200 people for its four concerts to date. Turnout was “much bigger” than most of the station’s previous events, according to GM Frank Dominguez. Small Batch concerts are free, but for $10 attendees can buy a pint glass that includes beer from Free Range Brewing, host of the concerts. The station also sells T-shirts, as well as vinyl records that have been donated to the station. WDAV entered the series in Current’s second annual Local That Works competition, a collaboration with the Public Media Futures Forums to spotlight innovative multiplatform initiatives at public media stations. The winning station will be chosen Oct. 25 at the Public Radio Super-Regional Meeting in Atlanta. Since its launch in November 2017, the Small Batch series has helped WDAV reach community members outside of its core radio audience, Dominguez said. At every event, he has talked to someone who didn’t know the station existed. The series also tends to draw a younger, more diverse audience “than what you tend to see at the usual recitals or concerts given by symphony orchestras or concert series,” he said. Free Range Brewing is a small brewery that doesn’t bottle or can its beer and only distributes locally. It was interested in the series to connect with new community members and because it aims to be not only a bar, but “a place where people can come together for all different types of events,” said co-owner Sarah Alexander. The brewery would have been pleased if 40 people showed up at each concert, Alexander said. But when 200 came out for the first event, the brewery immediately “recognized what a great value this is for our community, let alone business for us,” she said. “It’s been a great partnership from the get-go,” she said. Despite the informal setting, the station commissions chamber groups you’d expect to hear in a fancy recital hall, including an award-winning quartet and another performing world premieres of compositions. A promotional flyer for WDAV’s Small Batch Concert Series. But the concerts aren’t providing background music in a loud bar. Audience members are engaged in the performance and enjoy classical music but don’t necessarily enjoy “the formality of getting dressed up and going out to the concert hall,” Keible said. WDAV was interested in hosting an event at a brewery because it already has a “built-in audience,” Keible said, much like a concert series the station hosts at farmers’ markets. “I’m interested in placing classical music where people already go, rather than placing it in places I have to work really hard to get people to come to,” he said. Bars draw a steady stream of patrons, but “a music hall or a venue is not somewhere where you would find people every night of the week,” Keible said. The station was also able to attract new and diverse audiences to the concerts by promoting the events on platforms other than broadcast. It created posters with original art to hang on telephone poles near the concert venue and promoted the concerts at neighborhood association meetings and through the brewery’s marketing channels. From its outset, the series has been financially sustainable. In addition to providing a venue, the brewery also supplies some free beer for each concert and is an underwriter of the series. The station was also able to land a primary sponsor for the series. WDAV raised $6,000 in underwriting revenue for the series’ first season and made money from pint glass, record and T-shirt sales. Each concert costs $1,800–$2,200 for paying musicians and a sound engineer, covering beer costs, and upfront payouts for glasses and shirts. 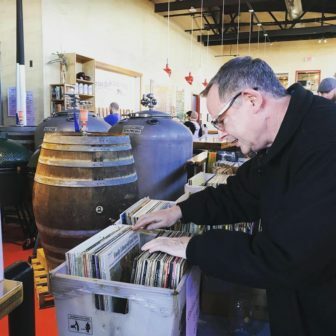 A Small Batch concert attendee flips through records the station sells during the events. “It’s a model that’s not going to make a station a ton of money, but they’re not going to lose any money if they find a good sponsor to get behind it,” Keible said. Though it hasn’t generated big bucks, the series has yielded other benefits. WDAV doesn’t directly ask audiences for donations during events but does use them to pitch underwriting prospects. In several cases, Keible said, potential underwriters who were undecided about buying underwriting on WDAV agreed to after attending a concert. They told Keible that they learned that classical music is a vibrant art form that appeals to people of all ages and “‘now I understand why my underwriting rep has been pestering me to underwrite on the station,’” he said. “It changes the perception of the station,” Keible said. Because of the first season’s success, the station will put on a second season starting in November. Its four concerts will expand beyond string quartets to include a percussion ensemble and a solo cellist. The brewery will also brew an exclusive beer for each of the concerts. “We’re trying to do more and more events realizing that we can’t just wait for folks to come to us — we have to go to them,” Dominguez said. By celebrating healthy babies and moms, Richland Source aimed to draw attention to its county’s infant mortality problem. Thanks for reporting this great news. Many classical musicians across the country have been bringing this dramatic music into bars, pubs, cafes, homes, etc. in bold new ways, esp. since violist Charith Premawardhana started the Classical Revolution movement in San Francisco in 2006. It’s been a huge pleasure, and fulfills the promise of the public domain, to make quartets and new music really work around popular culture. I’ve been composing and arranging famous symphonic works for my ensembles to share in these spaces and even let audience play in the snappy pieces on soft toy percussion. There are many ways to be excellent. It’s time we cut loose with classical music, because everyone deserves beauty!